Twenty years of Pakistan defeats at Australian hands were erased in little more than 20 minutes. The last five wickets belonging to Michael Clarke's befuddled team tumbled for eight runs in 46 balls after lunch, rather summing up the gulf between the two sides in a series Australia had expected to win. The final spoils were rightly shared by Zulfiqar Babar and Yasir Shah, the little-known spin duo which did not merely cover for Saeed Ajmal's absence but took advantage of it. Australia spent most of the preceding six months preparing for mystery offspin and doosras, even hiring Muttiah Muralitharan. Instead they were flummoxed by classical left-arm orthodox and legspin. Other garlands were rightfully saved for Younis Khan, the prolific and cultured runmaker who built the wall Australia's bowlers were never anywhere near tearing down. Then there was the captain Misbah, who showed total composure throughout the series before giving free rein to his skills with the equal-fastest Test century of all time. Above all else, Australia's display demonstrated how they will be illegitimate contenders for the title of best team in the world until they can find a way to thrive on the slow, low and turning pitches set-up to blunt their speedy brand of the game in Asia and elsewhere. Clarke in particular must wear a share of blame for the result, as he failed completely to set a batting example for less experienced team-mates. For most of the morning Steven Smith and Mitchell Marsh at least showed some evidence of learning how to cope with these climes, too late to change the series but perhaps an attempt to salvage some vestige of self-respect. Smith used his feet smartly and also defended stoutly in a fine display, but he lost the assistance of Marsh when the allrounder glanced Mohammad Hafeez straight to leg slip. Marsh had played doggedly and well, but he will regret not either leaving or hitting out harder at a delivery that was short and down the leg side. That ended a stand of 107 over more than two hours, and brought the pained Brad Haddin to the middle, still favouring his right shoulder after jarring and bruising it heavily on the first day of the Test. Haddin winced repeatedly when playing the ball but showed great determination in doing so, and Smith cuffed a pair of boundaries in the final over of the morning to reach the cusp of a fighting century. But two balls into the afternoon he became yet another batsman to play presumptuously for spin where none existed, pinned in front by a Yasir delivery that skidded on. 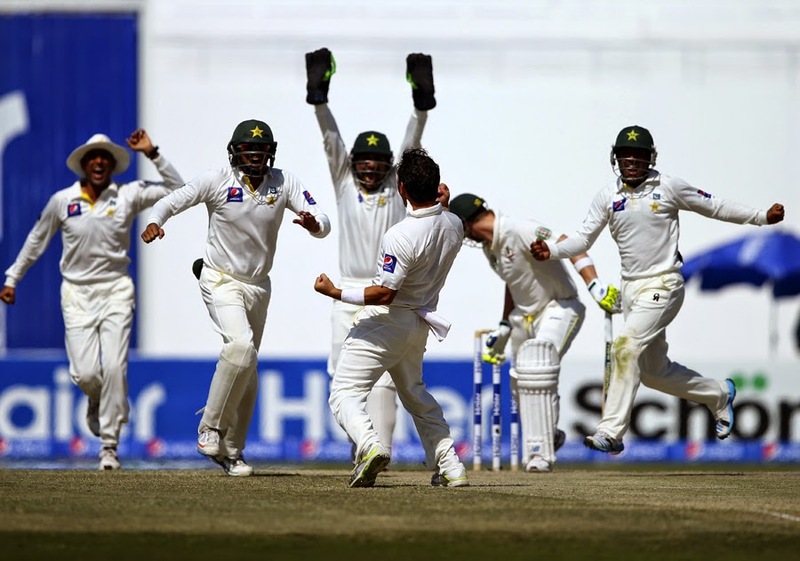 Haddin, Mitchell Johnson, Mitchell Starc and Nathan Lyon melted away within minutes, allowing Pakistan to celebrate. It's been a while. That's it folks. Australia's tour of UAE comes to an end. They must have been happy with how they performed in the ODI series, but their show in the Test series was dismal to say the least. Pakistan have bounced back well but their next task will be to keep the momentum going against the Kiwis. Younis Khan's total of 468 runs is the most number of runs by a Pakistani batsman in a 2-match Test series.